Since my last post we have had alot of ups and downs in the building process. After all the heating, plumbing and electrical was installed we were able to insulate and do the drywall which went super fast. Once the drywall was done we had a chimney installer come to install our chimney and was told that this wood burning fireplace we have cant be installed as the rules in Quebec are changing in 2019/2020 and we need to find out if this fireplace is approved or exempt after so many back and forth answers the fireplace we installed and the drywall was done around has to be taken out because its not approved nor exempt so when the laws change the government may make us take it out. The big thing is “may” and we spent so long going back and forth on what to do and its something we both want and wanted from the start so we decided to take the chance to see what happens in the new year. It was a huge expense but its so nice and we couldn’t find anything else that is that size and what we both liked. While that was happening I was ordering, tile, flooring, exterior siding front door, ect . We ordered our exterior siding on July 17th which was supposed to take 3-4 weeks, I emailed our supplier to see where our order was and she didn’t order it! She I guess “forgot” im not sure what happened. She placed the order and said we would have it as soon as she can get it. Fast forward to today we go our order Sept 5th my husband started to install right away and we are 3/4 done and ran out of siding! We contacted our supplier and she thinks the manufacture didn’t sent us the right order, needless to say we cant finish the outside for another 3-4 week because we have no more siding. Our front door was ordered July 20 it finally arrived on Sept 11 thats 8 weeks when it was supposed to be 4-6 weeks and its not the right order! 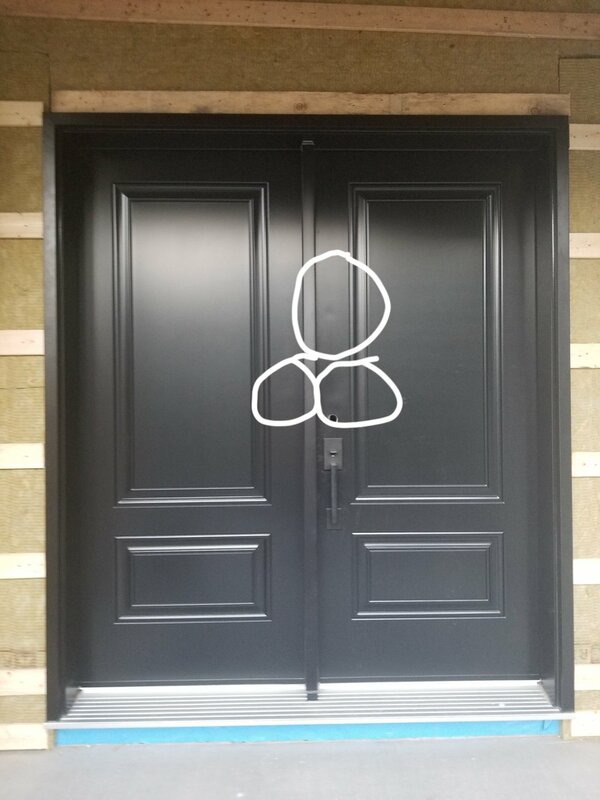 There is supposed to have holes on both doors as its a double door and I want 2 door handles, the hinges are supposed to be black not silver and there is 3 dents on the door. After waiting 8 weeks for a custom order, to receive a damaged door and not what you paid for is so upsetting..
We finally got the final glass for our windows in the living room which we ordered on June 12 it took 15 weeks to get glass! we had them send us the frames with plywood in where the glass was to go as we needed to move forward with the drywall ect and we couldn’t without the frames of the windows. Our window order is a whole other topic which can be a post just in itself as it was so wrong. 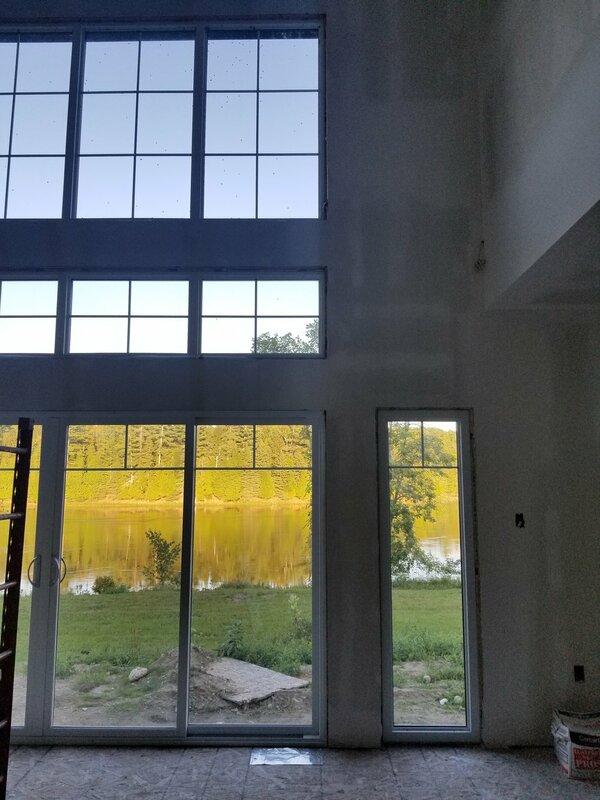 All our windows were to be casement which means they open expect 2 of our huge windows in the living room which are both 11 feet long because we cant physically get up there to open them and when we got our order 4 windows didn’t open. So we needed to return the windows wait again for new windows to be ordered and then our patio door was delayed, the grills in the windows didn’t line up with the windows below so replacement glass needed to be ordered. Finally mudding and tapping started and took longer then expected because of the humidity, it wasn’t drying fast enough even with fans so then our painting was delayed. Finally the sanding was done and I thought I had everyone scheduled and we were back on track. Wednesday and Thursday the tile people never showed up, finally they showed up Friday and never called to let us know, the installers came and they had tile for our mudroom, powder room and kids bathroom floor the rest of the tile i bought else where so we had another installer who showed up on time and started + finished the job over the weekend. The tile installers came without the tile for the powder room they didn’t pick it up and then didn’t have enough tile for the mudroom but had to much tile for the kids bathroom… i was so dumbfounded i didn’t even know what to say, it didn’t make sense, how can you show up without the right amount of material or the material at all. I talked to the designer at the store and she was going to send someone with the powder room tile, she sent the tile to be installed for the powder room that day but didn’t sent enough so the powder room and mudroom both are half finished and they said more was ordered and they would be back on Monday. We are Monday today and no one showed up i emailed her again and she said the tile would be ready on Wednesday what i dont understand is there is no communication, why weren’t we told this or why wasn’t our orders correct from the start. This morning i get a call from the same company but a different person that the flooring for the 2nd floor that was to be installed tomorrow arrived damaged so more has to be ordered and we cant get install until next week! Our painters started to primer the house the whole 2nd floor is done and paint 1 bedroom to show me the colour i choose and the white wasn’t coming out as the right “white” so now all the primer had to be returned and reorder as the primer had a “grey” tint to it so the tint was making our white colour look weird. So now the 2nd floor needs to be painted again and the main floor they are using different primer. NOW! you wont even believe this, all our hardwood flooring arrived and before unloading my husband and I double checked the name and numbers on the boxes to ensure its the right flooring; it was right, today when the staircase arrived and was being installed my husband opened the hardwood flooring box and put it beside and it doesn’t match! he called me and i just wanted to cry, i don’t know what else to do everything is wrong. The hardwood floor is not even close to the colour we ordered but the sticker on the box is the right name.. i have a picture of our flooring sample i gave to the staircase company to match it and now nothing matches, so they wouldn’t finishing installing the staircase because if they install it they cant take it out otherwise it will damage the wood. So now we are in a waiting game, waiting to hear from the hardwood store to see what happened then to tell the staircase people what to do, and waiting to know about our siding why we dont have enough to finish our house, waiting for our front door to be replaced, waiting for more tile, waiting for replacement 2nd floor.